The new interior secretary, a fifth-generation Montanan, views himself as a Teddy Roosevelt conservationist, but some are skeptical. WHITEFISH, Mont. — As a child in Whitefish, a town at the edge of the Continental Divide, Ryan Zinke cut his own trails through alpine forest, swam laps in Whitefish Lake and hiked the snow-packed paths of nearby Glacier National Park. 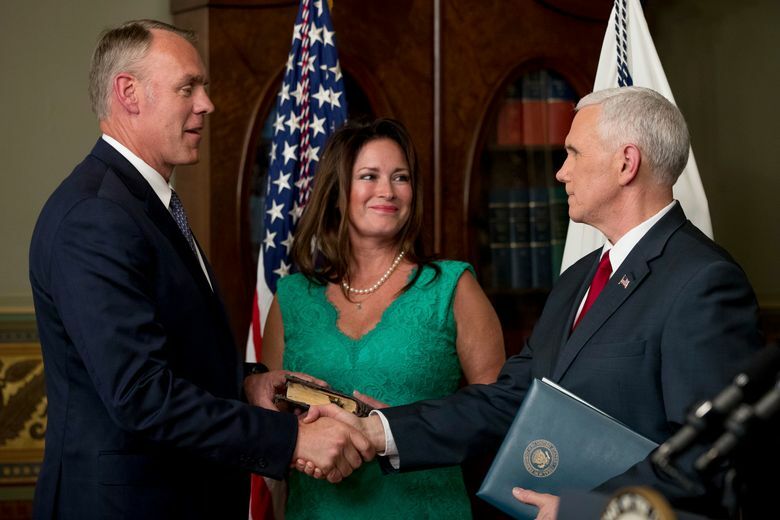 President Donald Trump picked Zinke, 55, a fifth-generation Montanan who grew up in this timber-and-tourism community, to be secretary of the interior. He was confirmed by the Senate on Wednesday by a vote of 68-31, and sworn in as secretary soon after. The position puts Zinke in control of 500 million acres of U.S. land — roughly a fifth of the nation — and he would be charged with balancing the department’s contradictory job of conserving land and mining it for resources at a time of intense pressure from energy producers, environmental activists, state lawmakers and his own boss, who made fossil-fuel jobs a crucial part of his campaign platform. Zinke’s portfolio includes the country’s 59 national parks and millions of acres rich in coal, oil, timber and natural gas, as well as the management of land and services for 567 native tribes. In the West, where officials like to say the interior secretary’s power is second only to that of the president, many are examining Zinke’s past, searching for clues to how he will chart their future. While he has cast himself in an uncommon role — a conservative conservationist — his critics say he is less of a friend to the environment than he would like to think. “I want to be optimistic, because he’s a Westerner,” said Chris Schustrom, 49, a Whitefish resident who was the ball boy for Zinke’s 1979 state championship football team and is now Montana chairman of the nonprofit conservation group Trout Unlimited. Westerners angered by land restrictions are hoping Zinke will help them peel back Washington, D.C.’s grip on public acres. For miners, ranchers and politicians in resource-rich regions, the Obama years were a rough ride. President Barack Obama blocked new coal leases, imposed moratoriums on uranium drilling near the Grand Canyon and set aside 553 million acres for national monuments, more than any other president. “I could not be more thrilled that Donald Trump selected him,” said Rep. Jason Chaffetz, R-Utah, who has tried to transfer millions of acres of public lands out of federal control. Zinke (ZINK-ee) spent his childhood fishing cutthroat trout from Good Creek with his stepfather, John Petersen, and hitching joy rides on train-car ladders, a habit he called “hooky bobbing.” His high school voted him class president three times, and he guided the Whitefish Bulldogs football team through an undefeated season during his senior year. At the time, Whitefish was still a one-stoplight town. It was in Whitefish and as a Boy Scout, he has recounted, that he developed his admiration for Roosevelt, who put aside 234 million acres for protection, saving redwoods and ancient rock formations even as detractors harped that the president imperiled states’ rights and hampered economic growth. After college, at the University of Oregon, Zinke joined the Navy SEALs, serving for 23 years and solidifying a disdain for leaders he called “desk jockeys” who directed policies from D.C. offices. In his 2016 book, “American Commander,” he wrote that front-line fighters were the ones best equipped to make decisions about everything from the battlefield to land management. Zinke entered politics in 2009, serving two terms in the Montana Legislature, and became the state’s at-large representative in the U.S. House of Representatives in 2015. He splits time among D.C., Whitefish and Santa Barbara, California, the hometown of his wife, Lola. He has three adult children: Wolfgang, Konrad and Jennifer. In office, Zinke has repeatedly said he is against the transfer of federal lands to state hands, bucking Republican colleagues who say D.C. controls too many Western acres. In 2016, after federal land transfer was added to the Republican platform, he resigned as a delegate to the party’s national convention. He has campaigned for more money for the Land and Water Conservation Fund, which uses energy royalties to preserve outdoor space. And in his nomination hearing, he disputed Trump’s claim that climate change is a hoax. He has a 4 percent lifetime score from the League of Conservation Voters, and oil and gas companies have donated nearly $350,000 to his campaigns. He is a strong supporter of coal — “we are not going to power our nation on pixie dust and hope,” he told a local crowd in 2014 — and has pushed to end Obama’s moratorium on new coal leases. More recently, he held listening sessions for a bill that would overhaul the Antiquities Act by requiring approval from local residents before a president designates a national monument. Roosevelt signed the 1906 law, and presidents have used it to push through unpopular preservation projects. And on Jan. 3, Zinke voted yes on a package that included a rule that would make it easier to transfer public lands out of federal hands. In some Whitefish circles, that set alarm bells clanging. “It seemed to contravene, to contradict, his stance that public lands are sacrosanct,” said Richard Hildner, 71, the deputy mayor. As secretary, Zinke will face several challenges, including a $12.5 billion maintenance backlog at national parks; ecosystems and budgets ravaged by drought and fire; environmental activists invigorated by the highly public protest of the Dakota Access Pipeline; tattered relations between Interior Department employees and local communities; and a president whose job promises may hinge on his ability to push fossil-fuel projects through the door.